FAIRFIELD — The plight of an osprey entangled in fishing line in Ash Creek this summer caught the attention of many, including the Connecticut Audubon Society and a group of volunteer students. The osprey didn’t end up surviving, but the incident prompted the creation and installation of bins in 16 coastline areas where fishermen can deposit used monofilament fishing line. The clear fishing line can be a hazard to swimmers as well as boaters, should the discarded line get wrapped around a propeller. In Fairfield, the bins can be found at the South Benson Marina boat launch and the fuel dock, the Jennings beach jetty, and Ye Yacht Yard in Souhport. Brian Carey, the town’s conservation director, said his department will coordinate the emptying of the bins with Audubon. The collection bins, made out of white PVC piping, were constructed by five members of the Scholar Athletes Serving Others, a volunteer group that draws from the high schools. The Ash Creek Conservation Association provided funding for the bin construction. Site monitors will be assigned to bins, and will periodically empty that assigned bin using proper safety procedures. The used fishing line cannot be recycled and will be collected by the state Department of Energy and Environmental Protection. It will then be sent to Pure Fishing America/Boat US, where it will be melted into plastic pellets for use as tackle boxes and fish habitats. 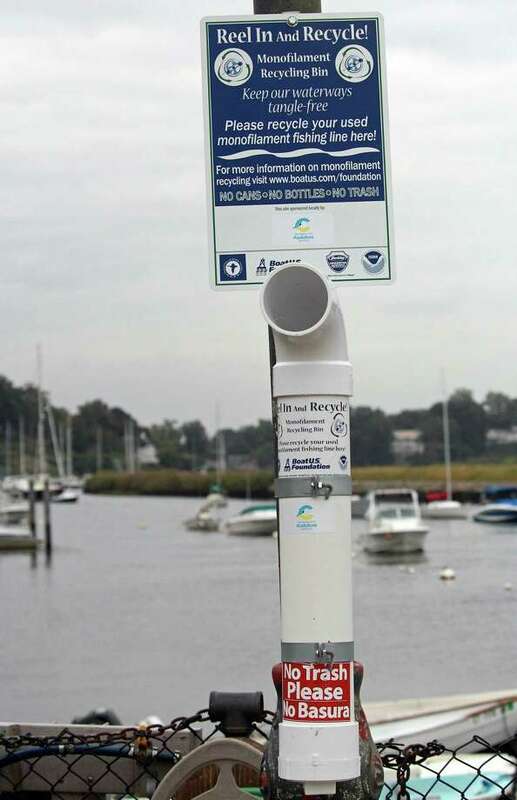 “We hope this project will inspire groups and marinas in other areas around the state to build and install their own fishing line recycle bins to protect our wildlife,” Milan Bull, senior director of science and conservation at the Connecticut Audubon Society. Locations in Bridgeport where the bins can be found include St. Mary’s-by-the-Sea, Arthur Street fishing area, Al Bennet Fishing Pier at Seaside Park, Seaside Park breakwater, Central Avenue fishing dock at Pleasure Beach Water Taxi pickup location, Bunnell’s Pond at Beardsley Park, and Captain’s Cove Marina and Cedar Marina.